LAMBERVILLE, JACQUES DE, Jesuit missionary to the Mohawks and Onondagas, younger brother of the missionary Jean de Lamberville; b. 1641, in Rouen; d. 18 April 1710 (some sources say 1711; others give 1718, but this is definitely incorrect), in or near Montreal. 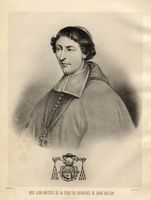 Jacques de Lamberville became a Jesuit at the age of 20 and taught in various colleges of the society in France before coming to Canada at the age of 34. He was immediately assigned to the Iroquois missions. Lamberville’s most illustrious convert was Kateri Tekakwitha*, a retiring young girl partly blinded by smallpox who had escaped the notice of his colleagues and predecessors, Fathers Bruyas and Frémin*, at Gandaouagué. One day in 1675 as he was making his usual calls from lodge to lodge he came upon her when she had been prevented by an injured foot from joining the other women working in the fields. He was surprised to find that since childhood she had greatly desired to embrace Catholicism. He began her instruction immediately, and his caution and thoroughness in instructing new converts is well illustrated in the case of this young girl for it was not until Easter Sunday 1676 that he baptized her. Her public confession of faith aroused opposition and persecution. Lamberville conspired with some visiting Huron and Iroquois catechizers, during the absence of her uncle and guardian at Albany (Fort Orange) in 1677, to send her secretly to a reserve near Montreal. Although he had been much impressed by the piety and virtue of this young woman he dissuaded her from attempting to found a community of Indian nuns. He knew from his experiences in the Iroquois cantons how little success such a foundation would have. He himself had, nevertheless, reasonably good results; in the two months preceding Easter 1676 he had baptized 13 adults and shortly after Kateri’s baptism another seven had been baptized. In his first year he had made about 50 converts, only ten of whom were moribund. In 1677–78 he joined Father Bruyas and jointly they baptized about 40 persons during the, year, most of whom died shortly thereafter. His time among the Mohawks was particularly difficult. On one occasion, for example, a drunken warrior attacked him in the chapel, shot at him, and then attempted to dispatch him with an iron bar. Only the midnight darkness and the Indian’s inebriated condition saved the missionary thus surprised at his devotions. Although his career was not as brilliant as his brother’s, it is evident that he was possessed of the same tenacity, courage, and forbearance as Jean. Not until 1684 did Jacques become actively involved in the political role often imposed on the missionaries by royal officials. In that fateful year he was summoned to meet Governor Le Febvre* de La Barre who was launching an expedition against the Senecas. 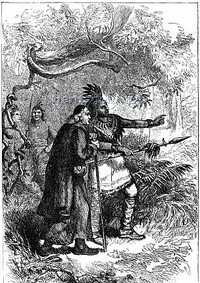 Jacques de Lamberville joined the expedition at La Galette (Ogdensburg) and was ordered to go to his brother Jean at Onondaga to reassure the tribesmen of French goodwill. He arrived at Onondaga on 17 Aug. 1684 and spent the whole night discussing political and religious affairs with his brother. In the morning the Onondaga chieftains were assembled and messengers were dispatched to the Oneidas, Mohawks, and Cayugas. After La Barre’s expedition collapsed, Jacques de Lamberville joined his brother among the Onondagas. It was he who carried the governor’s messages to the Iroquois in October. The year spent at Onondaga with Jean was a relatively successful one, owing in good measure to the improvised practice of medicine and dentistry carried on by the enterprising brothers. 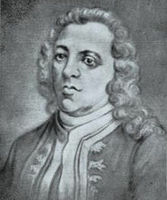 When Jean was summoned to Quebec in 1686 by Brisay de Denonville, Jacques remained among the Onondagas; he was the only missionary left in the Iroquois cantons. He too was soon recalled by Denonville, who was planning a campaign against the Senecas, and was assigned to chaplaincy duties with the garrison at Cataracoui (Fort Frontenac). Shortly after his brother joined him in this duty, Jacques requested an appointment at the Jesuit college in Quebec where he taught fifth and sixth form classes for a year. In 1689 we find Jacques de Lamberville at Sault-Saint-Louis (Caughnawaga) and two years later, in 1692, he was in residence at Montreal. 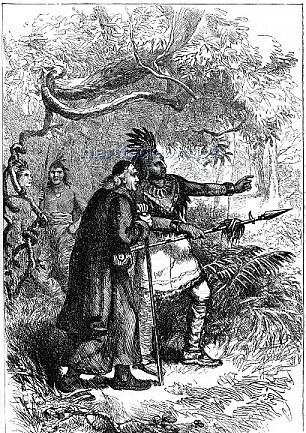 When the Jesuits were permitted to return to the Iroquois cantons in 1701, Jacques de Lamberville, though now quite old, insisted on returning to the Onondagas where his brother had worked for many years. In obscurity and self-denial he laboured until 1709 when English intrigues had become so effective among the Iroquois that evangelization was virtually, impossible. The final trial for Lamberville came when Abraham Schuyler tricked him into returning to Montreal to give an account of alleged English military dispositions and then had some drunken Indians burn his chapel and residence. Jacques de Lamberville remained in Montreal and was given charge of the business affairs of the Hôtel-Dieu along with the Abbé Henri-Jean Tremblay*. He became momentarily involved in the dissatisfactions expressed with Saint-Vallier’s [LA Croix] episcopacy and he went so far as to state that the bishop should resign because of the divisions he caused among both clergy and laity. Death overtook Jacques de Lamberville on 18 April 1710 at Montreal, according to Father Germain, his superior. He was eulogized for assiduously mortifying his flesh and preparing for martyrdom. The colonists recounted his rigorous piety and practices of self-abnegation; the Iroquois simply called him “the divine man.” It was not surprising that following his decease miracles were alleged to have happened to persons who merely touched articles which he had used. The official account of his 37 years of apostolic labours in Canada sent to the general of the Society of Jesus in Rome made special mention of his self-mortification and the miracles associated with his possessions. AN, Col., C11A, 4–9; C11G, 8, 169. Claude Chauchetière, La vie de la b. Catherine Thegakouita dite a présent la Sainte Sauvagesse (Manate [New York], 1887), 179. François Élesban de Guilhermy, Ménologe de la Compagnie de Jésus . . . assistance de France, comprenant les missions de l’Archipel, de la Syrie, . . . du Canada, de la Louisiane . . . , éd. [Jacques Terrien] (2 part., Paris, 1892), première partie, 514. JR (Thwaites). Juchereau, Annales (Jamet), 199, 297, 346. Lettres édifiantes et curieuses escrites des missions étrangères par quelques missionaires de la Compagnie de Jésus (30 v., Paris, 1707–73; nouv. éd., 26v., Paris, 1780–83), VI, 50. Mission du Canada: Relations inédites de la Nouvelle-France (1672-1679) pour faire suite aux anciennes relations (1615-1672) [éd. Felix Martin] (2v., Paris, 1861), II, 104–6. Campbell, Pioneer priests, I. 298–311. C. J. Jaenen, “LAMBERVILLE, JACQUES DE,” in Dictionary of Canadian Biography, vol. 2, University of Toronto/Université Laval, 2003–, accessed April 21, 2019, http://www.biographi.ca/en/bio/lamberville_jacques_de_2E.html.